I had decided that when a decent personal computer cost less than a car I would buy one. But I missed by a lot. My first real computer cost much less than a car. A company named Ohio Scientific came out with a single board computer. This machine consisted of a single fairly large circuit board (perhaps 12 X 18 inches) which included a keyboard and the electronics needed to drive a CRT (a TV monitor). It cost about $280 ($1250 in today’s money). It had no case, although perhaps one could be bought separately. On the surplus market I found a CRT (a display screen) complete with necessary electronics, but no case. I also found a pair of high speed magnetic tape drives that had been designed for a WANG word processor. With these, plus power supplies I designed, I finally had a complete, useful computer. I don’t remember if I had a printer, but I suppose I did. The final setup occupied most of the surface of my desk, and could not easily be moved. In essence it was built into the desk. 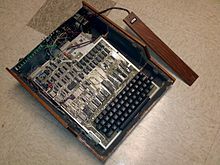 The single board computer had the Basic language built in. Basic, which stands for “Beginner’s All-purpose Symbolic Instruction Code,” is a very interesting language. Professors Kemeny and Kurtz at Dartmouth thought all students should know how to use computers, so they designed Basic to be easy to program. I think it is one of the first interpreted languages; you can execute Basic statements immediately, without going through a compiler. Basic ran on the Dartmouth time sharing system, and was made available to all Dartmouth students. Also, Basic was one of the first pieces of software to be offered to everyone free of charge. It shipped with almost all early personal computers. To make use of my elegant tape drives I needed an operating system. I love designing operating systems. I did not want to build it in Basic, so in Basic I built an assembler, a program that facilitates building software for the actual machine instructions. Then, using the assembler, I built an operating system. Now I had a complete, fully functional computer. I can’t remember what I used it for; the fun was in building it. This story has two morals: It’s more fun to build than to buy, and, bugs are almost always in the software, not the hardware. This entry was posted in Rudd's Blog, Uncategorized and tagged Bell Labs, computing history, early computers, homebuilt computer, single board computer. Bookmark the permalink.